The Exuberance Project film screenings take pleace on Sunday afternoon 13 May, curated by filmmaker Lesedi Mogoatlhe. The screenings will feature the enchanting Meokgo and the Stickfighter , directed by Teboho Mahlatsi and set in Lesotho. The film scooped two awards at the Durban International Film Festival: Best Short Film and Best South African Short Film. Meokgo and the Stickfighter recounts the tale of Kgotso, a reclusive rancher, lonewolf stick fighter, and virtuous nomad who wonders the Maluti Mountains of Lesotho. Orphaned since infancy, Kgots was cared for by a village elder and traditional healer, inheriting her treasured concertina upon her death. Watching over his adopted village, and often coming to the aid of defenseless shepherds who are terrorised by a roving band of ruthless cattle thieves, Kgotso leads an idyllic pastoral life pursuing the art of combat and music until he encounters a beautiful, enigmatic woman who, enchanted by the vibrant melodies of his concertina, begins to haunt his solitude. This will be followed by the radiant self referential film-within-a-film Grey Matter set in Kigali, Rwanda, and directed by Kivu Ruhorahoza. When Grey Matter, which The New York Times called “an acutely probing film”, premiered at the Tribeca Film Festival in 2011, it won both a Best Actor prize and a Special Jury Mention for its “audacious and experimental approach”. Grey Matter is Rwanda’s first feature film set in Kigali, Rwanda’s capital; the radiantly self-referential film-within-a-film describes the vision and trials of a determined filmmaker named Balthazar, as he tries to produce his first feature, The Cycle of the Cockroach. The trenchant drama, about a brother and sister dealing with the aftermath of genocide, finds no support from agencies only interested in funding upbeat policy-friendly films. 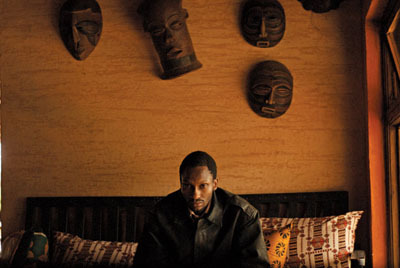 As Balthazar borrows recklessly from a loan shark, the Cycle plays out on the screen, subtly measuring the horror and systematic madness of events hardly unique to Rwanda, while offering insight into the effects of lingering trauma on all Rwandans*most interestingly those who were abroad during the genocide and therefore suffering a sense of tragedy and guilt by extension. The Exuberance Project aims to foster new views and fresh understandings of creativity in contemporary Africa, through consideration and celebration of what is extremely good, effusive and uninhibitedly enthusiastic. A particular application within the creative context of Southern Africa explores aesthetic capacities, as they appear in specific instances of the visual, textual, sound, performance, digital and virtual arts. Convened by Raél Jero Salley and Jay Pather; and presented by the Gordon Institute for Performing and Creative Arts (GIPCA), this weekend event will consist of a symposium, performances, exhibitions, panel discussions and film screenings at Hiddingh Hall, University of Cape Town (UCT) Hiddingh Campus, Orange Street, Cape Town and surroundings from 11 – 13 May 2012. The Exuberance Project updated programme is available for download. For more information, contact the GIPCA office on 021 480 7156 / fin-gipca@uct.ac.za. Bookings and ticket sales through Computicket. ICA announces recipients of the 2016 Fellowship program.